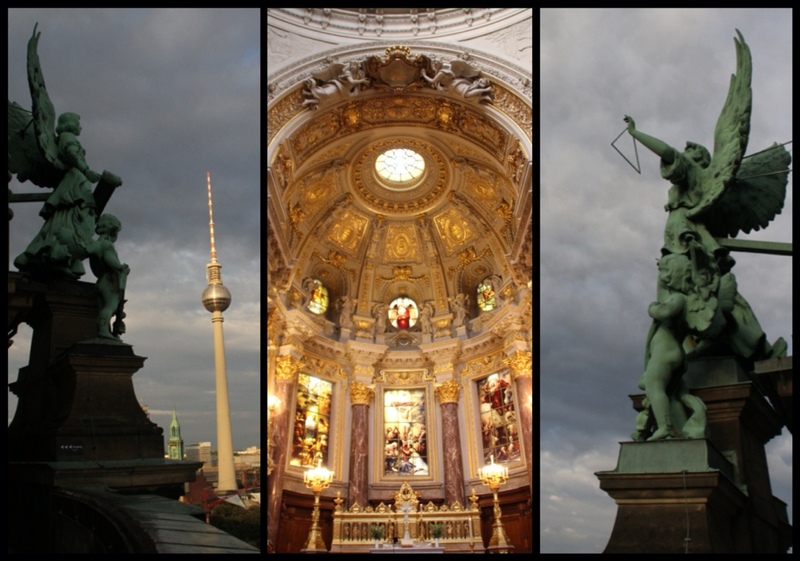 Berlin: A bear pit, St. Peter’s Basilica & Parliament Dome. 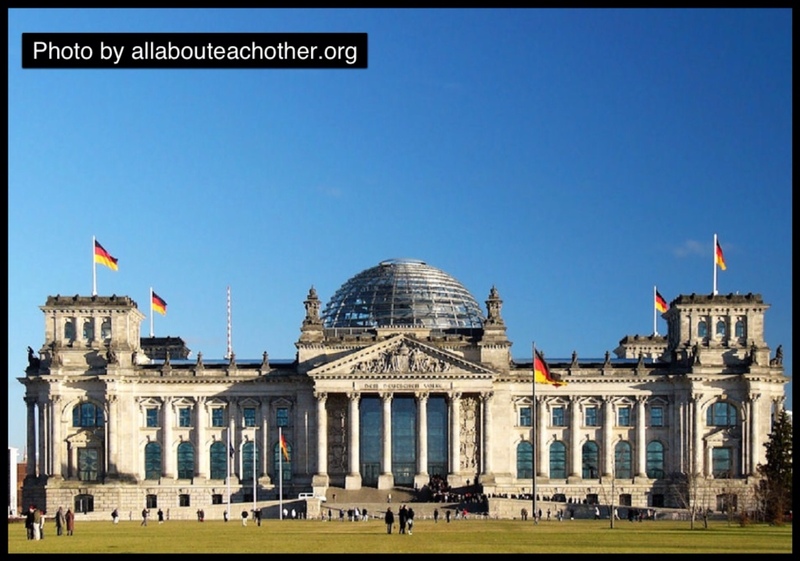 While we were planning our final day in Berlin, I ran across a list called, “10 quirky things to see in Berlin”! Perfect! It said that bears have been considered the ‘mascot’ of Berlin since its founding and in 1939 the city built a bear pit to house the 2 bears they got as a gift from the city of Bern. (They had a bear mascot too.) After the bear pit got bombed in WWII, Bern gave them 2 new bears- they had 33 cubs together! 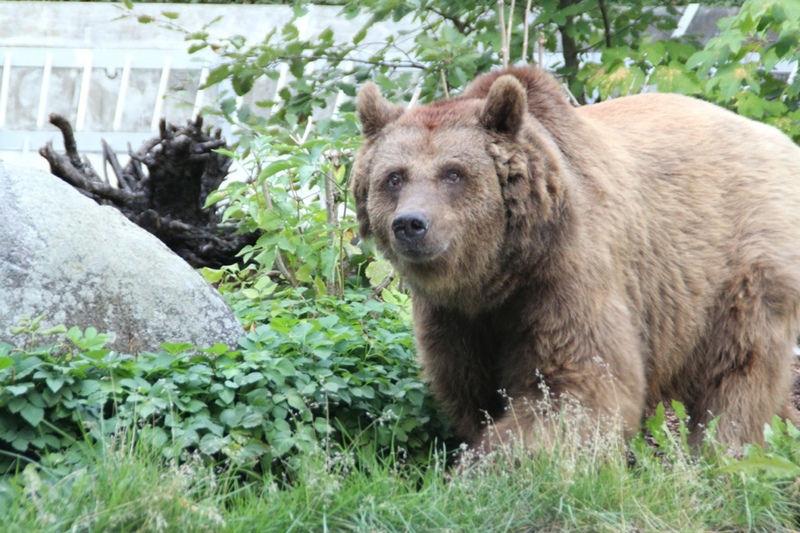 Currently, two brown bears live in a little park behind the Märkisches museum in Elly’s neighborhood! Off we go! Next, we headed towards the Turkish market. 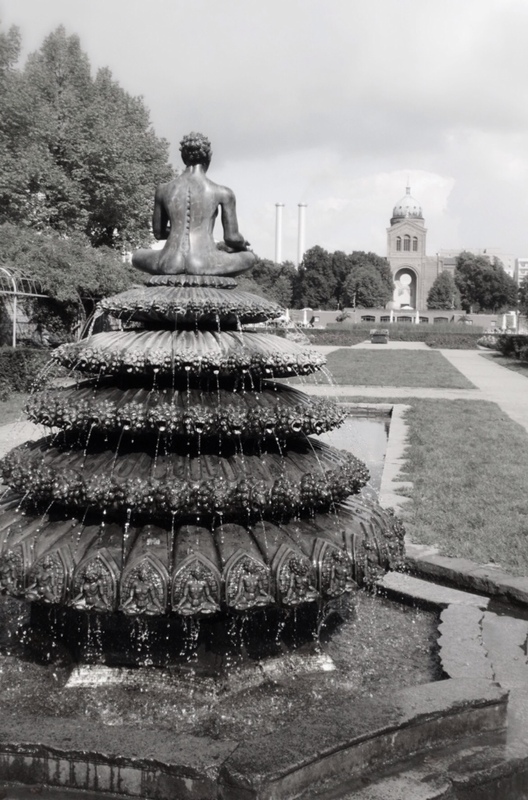 Along the way, we passed this lovely fountain. The church in the background is St. Michael’s, the dome & statue of the Archangel survived the war, but the church is missing its roof! Look closely, there is a round hole in the front of the building where a large stained glass window should sit. Onwards- to the Turkish… Oh wait! Bike school! 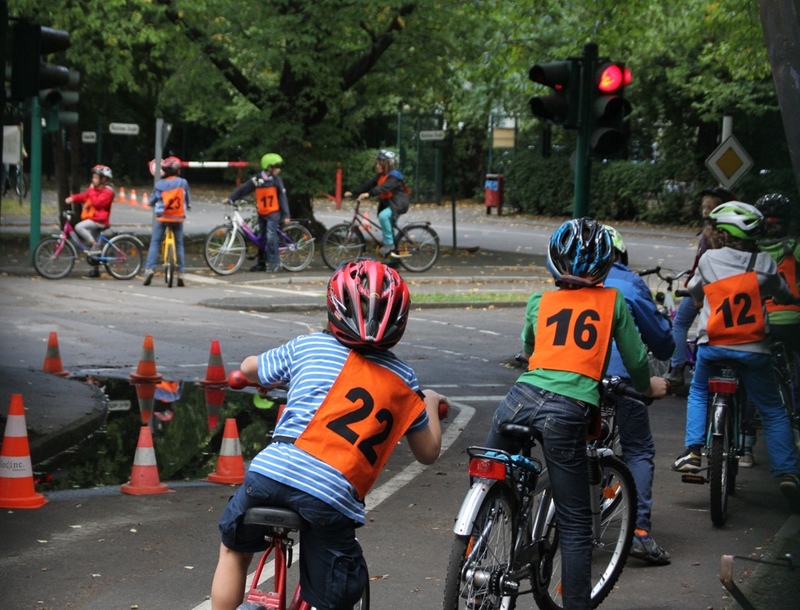 Kids in Berlin have to get a license to ride a bike on their own. We passed a cute pretend street where the police were instructing the kids on bike safety. Finally, we made it to the market! I had never had a fresh fig before, so we bought a few. They were soft & sweet , with a little hint of celery flavor. 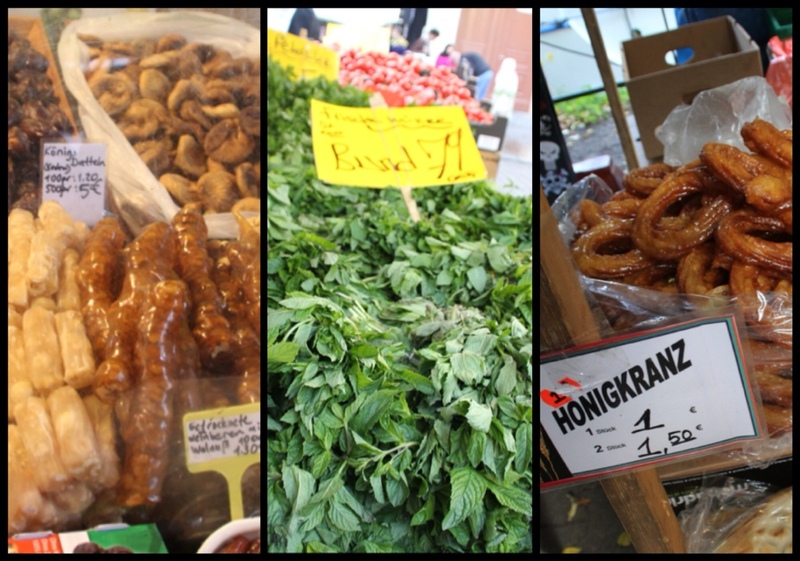 We tried some nut/fruit bars, smelled some mint & passed by the Honigkranz. We listened to a busker playing ‘Paint it Black’ by the Rolling Stones on a twangy, Turkish crank guitar. It was a lively atmosphere, packed with people on a Friday morning. Whew! Big morning! We headed back to Elly’s to check email and take a break. Berlin doesn’t have widespread Wi-Fi like Amsterdam. 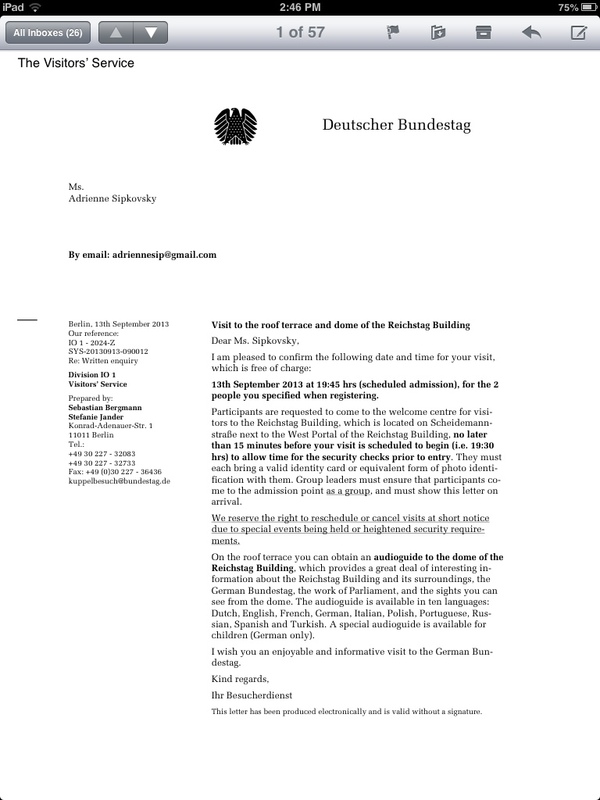 That morning, we had requested a visit to the glass dome on top of the parliament building & we were awaiting our official invitation to tour the dome in the evening. It arrived! Thanks Ihr Besucherdienst! 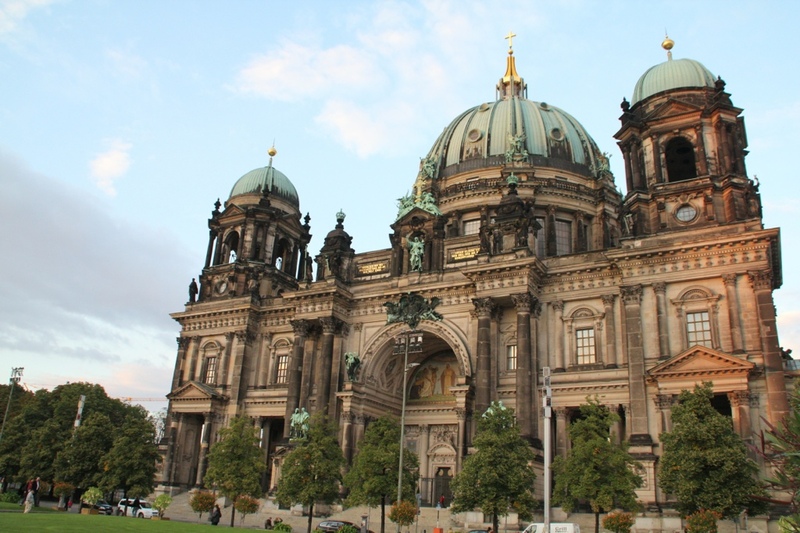 Now that we had secured a 7:30pm appointment at the Reichstag Building, we made our way towards Museum Island to check out St. Peter’s Basilica. 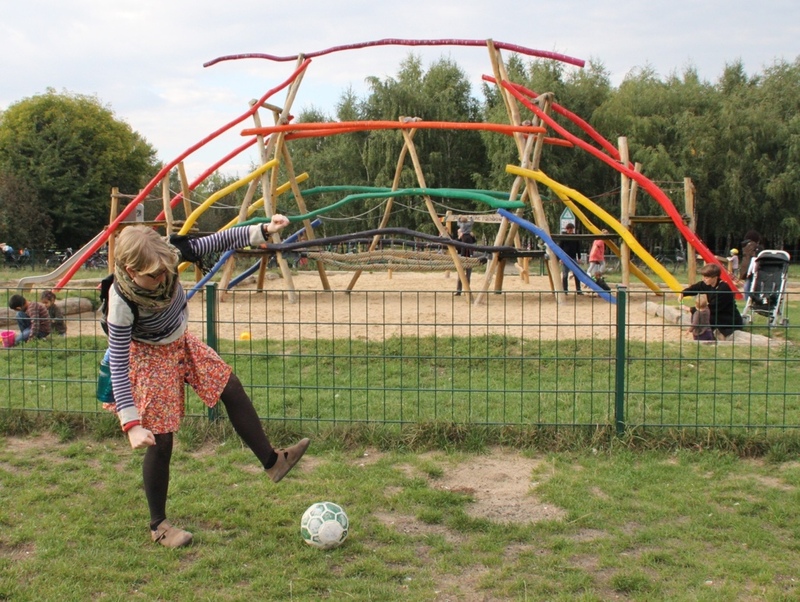 On the way, we took a detour to see a cute park that Elly remembered from childhood visits to Berlin with her parents. 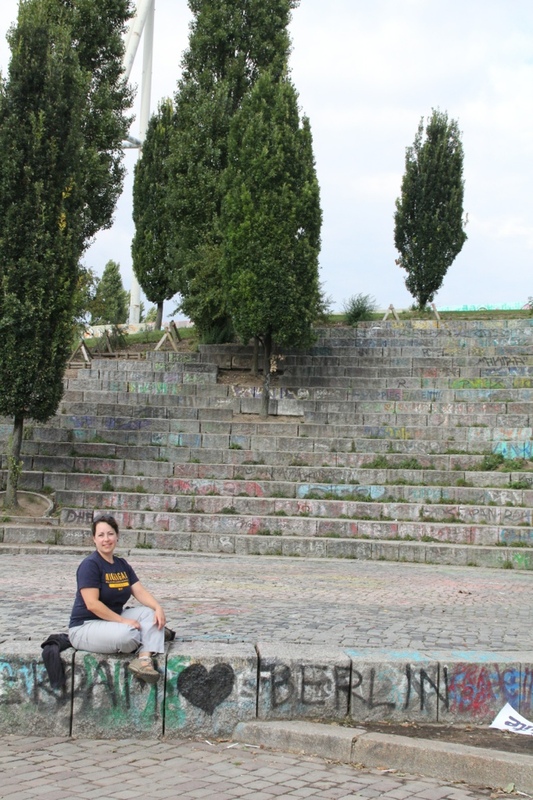 We hopped the S-Bahn and ta-da! There it was, the Basilica! Check out those gorgeous domes! 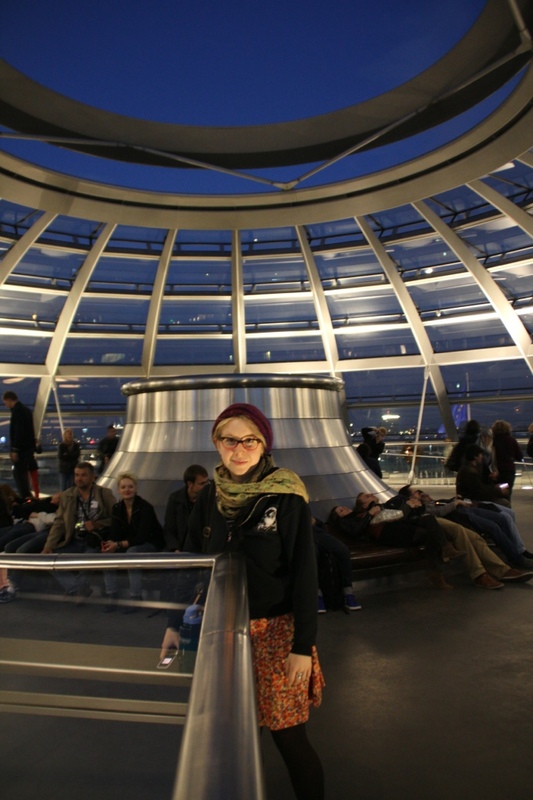 We admired the sanctuary, then climbed up to the central dome and circled our way up to the walkway, high above Berlin. 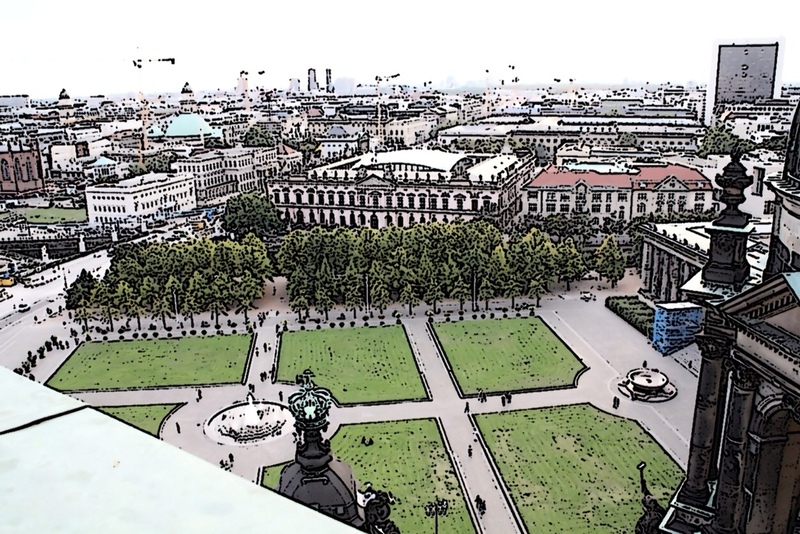 Cartooned photos from the top of the dome. The grassy sections used to be the promenade and gardens of the royalty. The circle on the left is a fountain, the circle on the right is a giant stone bowl that was intended to go into the building on its right…but it was too big! That building is the Pergamon Museum and in the 1940’s, the square would fill with people coming to hear Hitler speak from its front steps. It was almost time for our official appointment at the parliament dome! 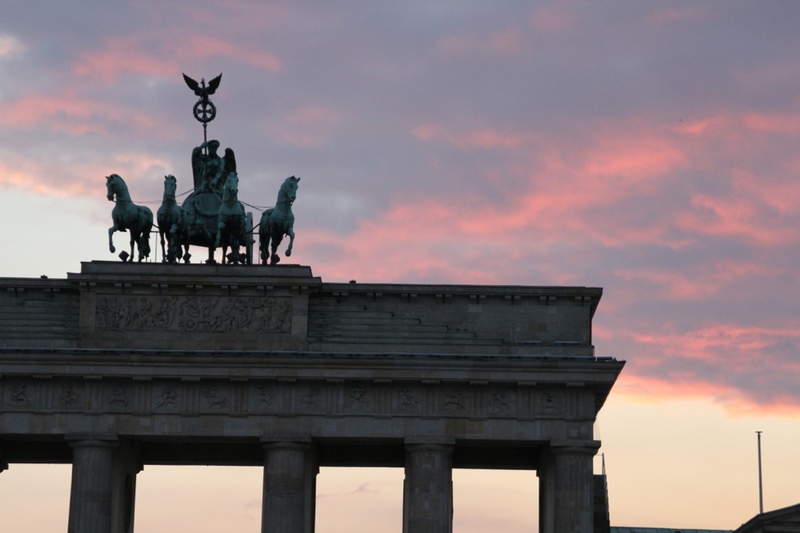 On our walk there, we passed the Brandenburg gate at sunset! We arrived 15 min. before the appointed time to go through security. They checked our invitation twice and matched our passports to the names on their list. After our bags were x-rayed and we got patted down, we were led in a group to the parliament doors by a guide. As we waited to get through the air-lock, we could see into the immense, circular room where the parliament meets, under the dome. It was impressive and I could imagine a futuristic, intergalactic council meeting happening there. 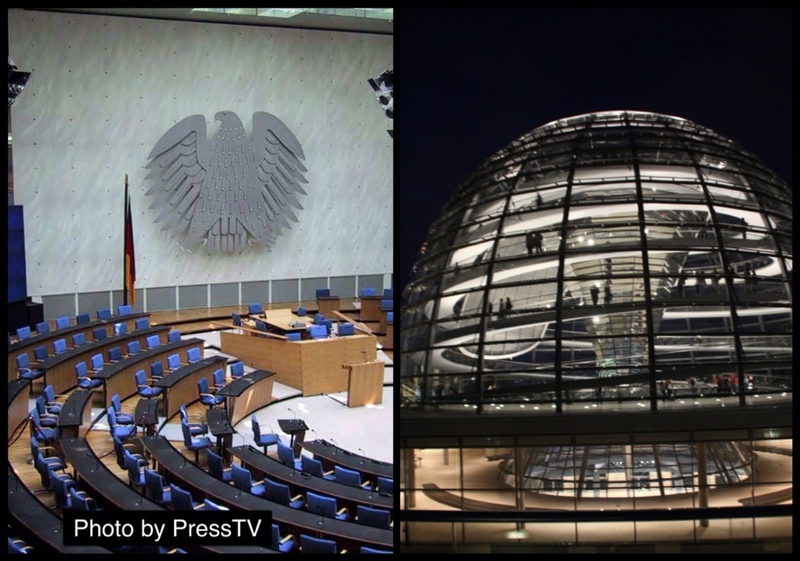 Then, we were cleared to enter the elevator and exited on the roof of the German Parliament, in front of the dome. The dome was pretty amazing. The views were great, it was .00€ (aka. Free!) and the design was interesting and environmentally friendly! The funnel-shape in the center of the dome is covered with mirrors to direct sunlight into the circular meeting room, below (saving electricity!). The oval piece in between the mirrored cone & the spiral walkway is a shade and it rotates to diffuse the sunlight. Pretty neat! The top of the dome is opened to the sky! We left the dome and headed to an Ex-pat dinner held at the bookstore, ‘Another Country’. A yummy feast of Mexican food with some new friends and then we took our tired selves home. Tomorrow I take the train to Prague to meet up with Natasja! Hieperdepiep! Hoorah! 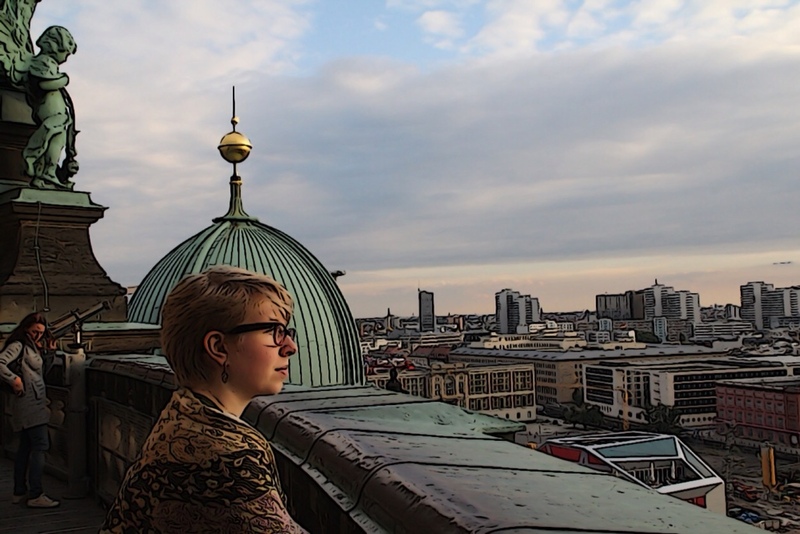 Next Article Prague/Praha/Praag: It all depends on how you see it.